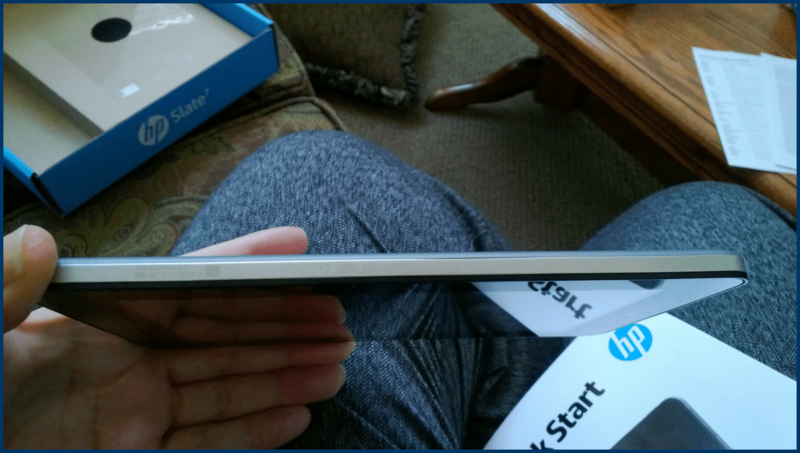 One of the perks of working for HP is getting an early peek at the new Slate 7, which is due to go on sale later this month. I got my hands on this sweet little device while I was technically still on medical leave – and I suspect it was a concerted effort to keep me from returning to work too early due to boredom. It certainly made recovery more fun and probably helped stave off any need of painkillers by providing days’ worth of fun distractions. My first Android device was a Garminfone running Android 2.1 “Eclair.” I loved that phone – until the day I realized I’d have better luck chucking it forcibly at an assailant’s head than dialing 911 on the run. It was a wonderfully tiny little PC that fit in the palm of my hand. It was a fantastic navigation device. But it was a lousy phone that wouldn’t reliably make a call.Still, I’ve missed Android. I think it’s well suited to a 7″ tablet. 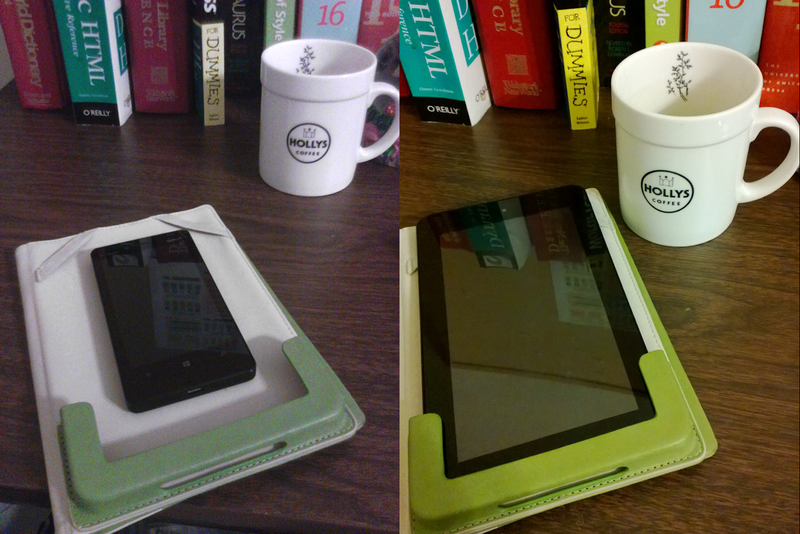 My other “tablet” is an older model Barnes & Noble nook eReader. With its eInk display, it’s perfect for reading books, but doesn’t make phone calls and only surfs the Web in black and white. Most sites look surprisingly good in black and white, but the browser is “experimental” and navigating it with the little touch bar below the screen is…odd. The Slate 7 comes with a power adapter, USB cord, and manuals. You can see the full specifications for the Slate 7 here. It was easy and fast to set up. I have an HP Color LaserJet CP1510 series PCL6, and was thrilled with how easy it was to print to it using the HP ePrint app. The device feels light enough until I’ve played with it for an hour or so, then go to answer a call on my smartphone. First time that happened, I nearly threw the phone across the room. But I like the fact that the tablet has a sturdy, substantial feel to it – it doesn’t feel flimsy or likely to break. I have a dedicated camera – it’s a Sony Cyber-Shot DSC-H70 16.1 MP Digital Still Camera. I don’t use that as much as I do the camera in my smartphone, simply because I don’t like to travel like a pack-mule and the smartphone photos have a bit less digital noise, generally. I like both, and I can’t imagine replacing either with a tablet. The tablet’s phone is lower quality and fixed focus. I can’t just tap on the subject of the photo – I have to tap the blue shutter button on the screen to take the picture. There’s no flash. Still, I discovered a reason to love the camera on the Slate 7 this morning: Skype. Don’t laugh. I’m horribly self-conscious when it comes to audio and video recordings. I’ve had to confess to friends that my webcam wasn’t really broken, I just didn’t think I could talk to them intelligently on Skype if they could see me. In fact, I feel pretty stupid just talking out loud at my PC, and prefer to use text chat. But this morning, I was sitting on the couch when my phone rang. It was my cousin Matthias, in Germany, trying to connect with me on Skype. I’ve never used Skype on my phone, and it wasn’t responding. So I whipped out the Slate 7 – amazingly, I’d loaded the Skype app on it and even set it up – and called him back. I get to talk to Matthias about once a year, if I’m lucky (or once a decade, if I’m not), so self-consciousness be damned. We played around with Skype and video and chatted for a full hour! Stuff like that used to cost us $60 and up – but this was free. You can see, at left, the difference in size between the Slate 7 and my Nokia 810 smartphone. The beige and green case is a spare cover for my nook, and it holds the Slate 7, which is slightly narrower than the nook but about the same thickness, pretty securely. The picture will also give you an idea of the difference in rear camera quality – the Slate 7 camera is 3MP and the Nokia is 8MP with a Carl Zeiss lens. Both were taken using default settings and no flash, at night with incandescent lighting. The only post-processing here is making both images 800 pixels wide, so that I could combine them into one side by side image. The image from the smartphone (right) is crisper, the colors almost too vivid. There’s a lot of noise in the image from the tablet (left), and the colors seem muted – a bit washed out – but slightly more natural. Here you can compare the front-facing camera quality. This was a pleasant surprise, quite frankly. The smartphone (right, 1.2 MP) makes me look exceedingly…purple. I think it knows purple is my favorite color, but it goes too far. I don’t want a purple face! The Slate 7 (left, only 0.3 MP) is the clear winner here! Viewed up close, images look overly smoothed – but as seen here, quite acceptable! Don’t blame either device for my shoddy photography skills – I’m assuming if you’re looking at the camera on a $169 Android tablet, you’re not planning to use it for professional photography, either! Sound doesn’t really begin to shine until you connect headphones or a decent set of earbuds. My personal faves are my new Turtle Beach Ear Force m5 headset (if I’m recording audio or simply want to shut out the world), or my Bassbuds earbuds (more comfortable for falling asleep while listening to Spotify). That’s when you notice the quality of the Beats Audio on the Slate 7, although this morning’s Skype call was sufficiently clear and audible with just the built in mic and speakers. Once you enter or set up your Google account, the real fun begins – exploring the apps in the Google Play store and customizing your tablet! Amazing HP slate!!! It has great features. Love that device. Looking good. Don’t’ want to wait that much!!!! It really does, Amit! Hopefully, you won’t have to wait too much longer. Me too! I think it will. Price seems right – good value – and it works well. Android’s got a lot of traction, tons of apps, etc. Funny way to think about it, but if you only got $5 worth of entertainment and productivity out of it every day, it would pay for itself in about a month. I’ve already decided to replace my old paper planner with it and use Google calendar and tasks, instead. So that’s a good $30/year I don’t need to spend on planner refills. I’ve added BOTH nook and Kindle apps (free), so I have a color eReader that will read ePub and Amazon books, and others too. I’ve got several highly addictive games on it. I can use it to blog on the go, although for long content creation I still prefer the desktop and a full-sized keyboard. But what if I added a bluetooth keyboard? I just might… I’m seriously considering it. Glad to hear it, Qasim. Price is good but am not sure about touch performance. I have used a Toshiba 7 inch tablet for a few days, but the touch was very disappointing so i sold it. I’ve had no issues with touch performance on this, Adam. It’s been very responsive.